A wicker basket full to the brim of beautiful fabrics, ribbons and hand carved Oak wood buckles remains untouched in my sewing room. Alas, this is my yet to start belt project. I do hope to get something produced and for sale in time for Australian summer. In the meantime I must set aside a few hours a week for my blog. After cooking, laundry, cleaning, grocery shopping and the school run I don’t have much time. I’m not complaining, just trying to explain away my two week absence. Again, short and sweet today. This week’s post showcases the work of the 1970’s textile designer Grace Sullivan. I absolutely love her work and here is a selection of favourites. This opulent cotton sateen fabric below is ‘Ophelia’ and I have four glorious meters, enough for a pair of fabulous curtains. It features huge stylised flowers and is almost art nouveau in style. The colours are bright with shades of pale blue, turquoise, pink, lilac and deep blue. This fabric would look amazing made into cushions, lampshades or wall art. ‘Desdemona’ is another all time favourite. The stylised depiction of the real flower gives the fabric lots of texture and flow. It was avaiable in many colourways, here are four. It came in cotton, viscose and Irish linen. Sarawak is one of two Malaysian states on the island of Borneo so I assume that Grace took inspiration from the flora there for this fabric of the same name below. I bought this from Anya’s Attic on Etsy. 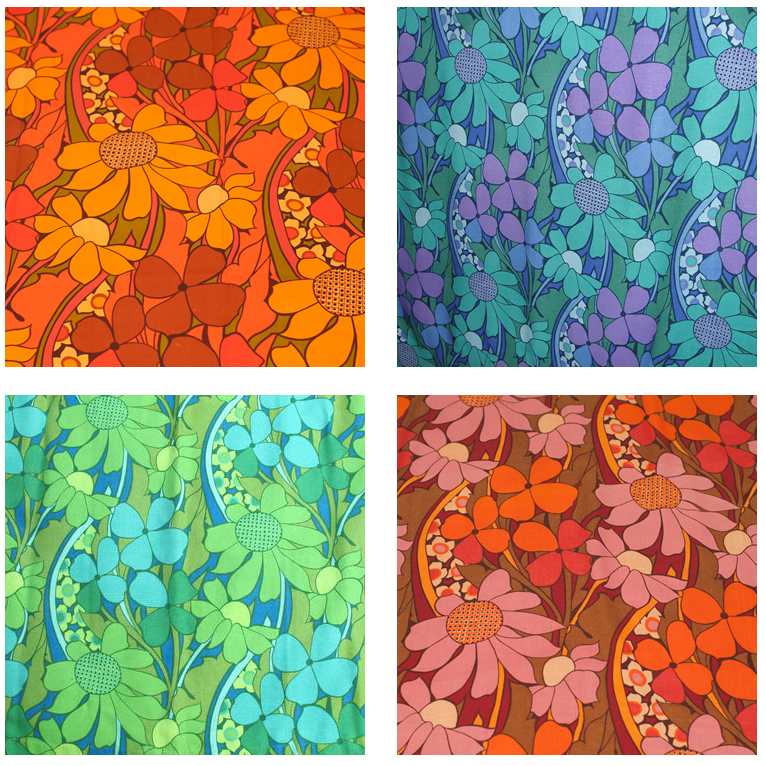 Another popular 1970’s Grace Sullivan print was ‘Tree Tops’, also art nouveau in style. Unfortunately I don’t have great images of this fabric so I’m using this fabulous cushion image from Lucy Bates Vintage Fabrics. I’ve just purchased these wonderful books and I’m hoping they’ll provide some much needed information on more of Grace Sullivan’s work so I can add to this post. I have a length of Grace Sullivan fabric called Sonata by Textra in lime green and white. I had it in my flat in West Hampstead at the beginning of the sixties. Is there a market for it? Approx. 4 metres in pretty good unused condition. Might benefit from a wash.
Hi there. Best not to wash it as it might fade..Just air it outside if you can. 1. I can buy it. I’d love to see a photo first of course. I usually buy for around £8/metre (UK pounds) so a total of £32. Plus I would pay for postage (I have a UK shipping address in Berkshire). 2. You can list it on eBay and it should sell, you may even get more for it (if I find it on eBay UK and like it I will bid on it so yu may well up selling it to me that way). Let me know, I look forward to hearing from you.